Series :- Series : Q Series .Design :- Type : Boundless 360 with Brushed Metal Back Finish .- Screen..
- Series : Q Series . - Type : Boundless 360 with Brushed Metal Back Finish . - Screen Type : Curved Panel . - Backlighting : Edge-lit LED . - Design : ZERO(Simple Edge) . - Bezel Width : 4 Bezel-less . - Color : Sterling Silver . - Stand Type (Color) : Real Stainless_Type U . - 4K Ultra HD Connected : Yes . - Style : Curved . 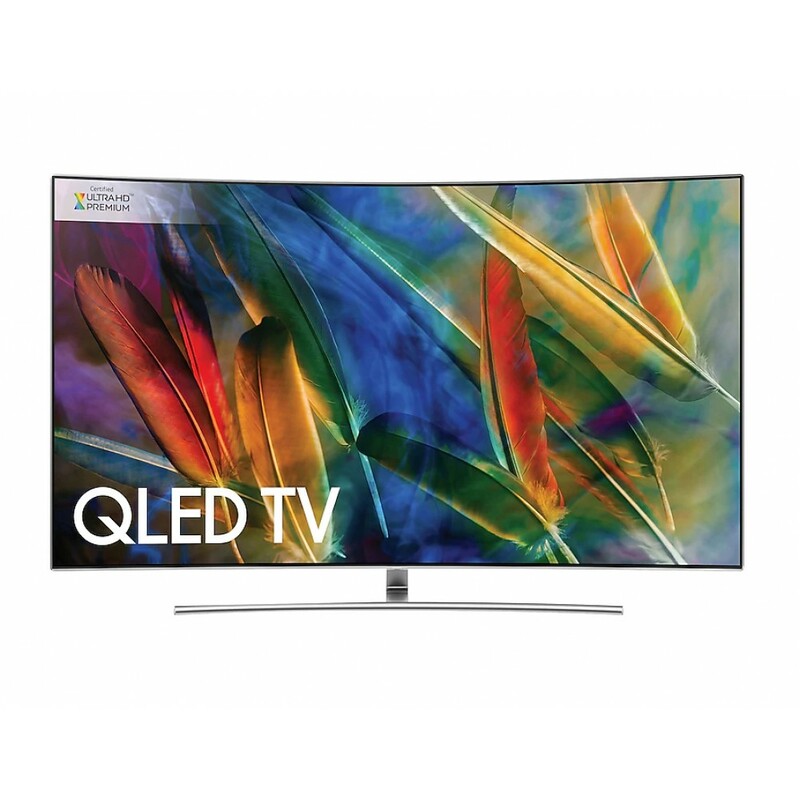 - TV Type : QLED . - Screen Size : 64.5" Measured Diagonally . - Resolution : 3,840 × 2,160 . - Motion Rate : 240 . - Color : Q | 4K Color Drive Elite . - 10bit Support : Yes . - HDR (High-Dynamic Range) : Q ] 4K HDR Elite . - Blacks : Q ] 4K Elite Black . - Picture Engine : Q Engine . - Quantum Dot Color : Yes . - Auto Depth Enhancer (Geometric CE) : Yes . - UHD Upscaling : Yes . - Depth Enhancing Technology : Auto Depth Enhancer . - Dolby : Yes . - DTS Premium Sound : Yes . - Sound Output (RMS) : 60W . - Woofer : Yes . - Speaker Type : 4.2Ch . - Multiroom Link : Yes . - Bluetooth Headset Support : Yes . - Wi-Fi : Yes . - Wi-Fi Direct : Yes . - Bluetooth : Yes . - Smart Hub : Yes (incl. Sports, Music and TV Plus) . - Processor : Quad-Core . - Apps Platform : Smart TV with Apps and Full Web Browser . - Digital Clean View : Yes . - Auto Channel Search : Yes . - Voice Interaction : US English, Spanish, French . - Auto Motion Plus : Yes . - Smart View 2.0 : Yes . - Smart View : Yes . - Ultra Clear Panel : Yes . - Ultra Black : Yes . - Dimming Technology : Superme UHD Dimming . - Precision Black (Local Dimming) : Precision Black Pro . - ConnectShare™ : Yes . - Embedded POP : Yes . - RVU : Yes . - OSD Language : English, Spanish, French . - InstaPort S (HDMI Quick Switch) : Yes . - Anynet+™ (HDMI-CEC) : Yes . - Closed Captioning : Yes . - Electronic Program Guide (Channel Guide) : Yes . - V-Chip : Yes . - Game Mode : Yes . - Bluetooth® : Yes . - USB HID Support : Yes . - One Connect : One Connect Optical . - Eco Sensor : Yes . - Auto Power Off : Yes . - Peak Illuminator : Peak Illuminator Pro . - Easy Pairing : Yes . - TV to Mobile - Mirroring : Yes . - Mobile to TV - Mirroring, DLNA : Yes . - HDMI : 4 . - USB : 3 . - LAN : Yes . - RF In (Terrestrial/Cable Input) : 1/1(Common Use for Terrestrial)/0 . - RF In (Satellite Input) : 1/1(Common Use for Terrestrial)/0 . - Digital Audio Out (Optical) : 1 . - Audio Return Channel Support (via HDMI port) : Yes . - Servic : RS232C : 1 . - ENERGY STAR® Certified : Yes . - Power Supply (V) : AC110-120V 50/60Hz . - Typical Power Consumption : 90 . - Maximum Power Consumption : 240 W .
- Standby Power Consumption : 0.4 . - DTV Tuner : ATSC/ClearQAM . - Digital Broadcasting : ATSC/ClearQAM . - Analog Tuner : Yes . - Optical Cable : Yes . - No Gap Wall Mount Ready : Yes . - Optional Stand Support : Yes . - Set Size with Stand (W x H x D) : 1442.3 x 915.1 x 374.9 mm . - Set Size without Stand (W x H x D) : 1442.3 x 827.9 x 105.2 mm . - Package Size (W x H x D) : 1617.0 x 961.0 x 210.0 mm . - Set Weight with Stand : 27.70 kg . - Set Weight without Stand : 24.0 kg . - Package Weight : 38.20 kg . - Remote : TM1790A (Smart) . - Remote Control Battery : Yes . - Mini Wall Mount Compatibility : Yes . - Vesa Wall Mount Compatibility : Yes . - Power Cable : Yes . - User Manual : Yes . - E-Manual : Yes .